On December 7, 2018 LEGO announced that, as part of the on-going promotions for those who obtained a Star Wars Black VIP Card by purchasing the Ultimate Collector Series Millennium Falcon (75192) early upon its release in 2017, an exclusive set would be made available for Black VIP card holders with any purchase of LEGO Star Wars merchandise through shop.lego.com while supplies last. The exclusive set, titled VIP Frame, is essentially a companion set for the Black VIP card itself. The set includes a brick-built stand to hold and display the Black VIP Card, a spare Black VIP card, and an exclusive Black VIP minifigure. The 42-piece set comes in what appears to be a polybag; however, the plastic is actually a bit stronger and feel of a higher quality than traditional polybags. The plastic wrap also contains a sealed flap on the back of the bag which I suppose could be used to reseal the set, should you decide to reseal the set in the packaging for storage and safe-keeping. In addition to the pieces and the building instructions, and to my surprise, the set also includes an additional Black VIP card. 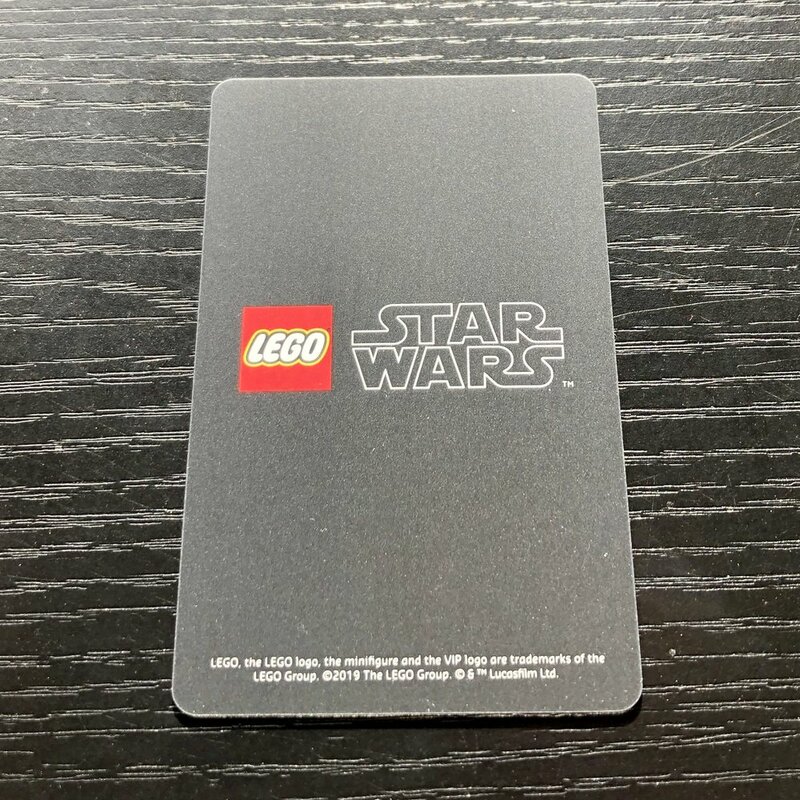 I was honestly expecting to have to pull out the original Black VIP card I received after purchasing the UCS Millennium Falcon and use it in the brick-build stand. Instead. LEGO kindly includes an extra Black VIP card with the set to include in the build and keep on display. This is great news for people wishing to display their Black VIP card on their desk, next to their UCS Millennium Falcon, in their LEGO collection, etc. while also keeping a spare Black VIP card in their wallet for use at the LEGO Store. The Black VIP card included is an exact replica of the card which was sent out to early buyers of the UCS Millennium Falcon set last year. The only exception being the omission of the cardholder’s name below the VIP logo on the front of the card. Honestly, it’s great having a brick-built stand to display my Black VIP card directly next to the UCS Millennium Falcon, but the true star of the show concerning this set is the exclusive Star Wars Black VIP minifigure. The inclusion of an exclusive minifigure which includes an exclusive Millennium Falcon print on its torso (the back of the minifigure contains no prints and is all solid black), in my opinion, is what elevates this promotional set from “meh” to a treasured piece in my LEGO collection. Yes, the Black VIP promotions overall have certainly been underwhelming, but having an exclusive minifigure which matches the VIP minifigure we’ve seen on all the marketing material for the Black VIP card is a great, tangible and displayable reminder of of all the fun the UCS Millennium Falcon and it’s promotions have been for those of us fortunate enough to have acquired the UCS Millennium Falcon. Following the hype, release, and promotions of the UCS Millennium Falcon has been one of the absolute highlights in my LEGO fandom, and having this figure as a representation and reminder of the experience is a very welcomed addition to my LEGO collection. The end result, once the set is assembled, again is a nice and very simple display set and makes for a great, supplemental display companion for the UCS Millennium Falcon. It brings about a an extra layer of exclusivity to the UCS Millennium Falcon set and overall experience. When displayed with the Falcon it heightens the premium feel of the UCS Millennium Falcon - a set which on its own has no trouble in the “hey, that looks premium” department.